It's been almost a month since I last went out to create photographs. Lately I've been feeling out of practice, uninspired, and unsure of my photography. In late December my wife and I moved into the D.C. Metro Area to the city of Alexandria, VA. Needless to say, moving halfway across the country is rather stressful! You become so focused on planning the move, packing, and then unpacking that everything else seems to fall to the wayside. Before I knew it moving day had came and went, and I was left feeling overwhelmed at the thought of exploring the area. I kept busy with setting up the apartment to distract myself from the seemingly insurmountable task of learning the ins and outs of a new community, new city, new state. Then, just as I was running out of ways to divert my attention, we bought two books that detail the plethora of trails near D.C. and in Northern Virginia. I have spent lots of time on the east coast before, thanks to the cabin my family owns in the blue ridge mountains near the southern border of Virginia, so I knew that the area had a diverse offering of ecosystems to visit. Flipping through the books one afternoon, I was reminded of the mountains, forests, shores, rivers, plains, bluffs that now surround me. I began to feel the familiar yearn for adventure, and I knew it was time for me to go out. I combed through the trails, narrowing my options to those near water, and eventually I chose the Great Falls Park. It's a perfect combination of trail options, water features, and drive distance. I was getting excited, and just a day later I set off to rediscover my enthusiasm for the outdoors. Like everything on the East Coast, the Great Falls have a long and storied history. The area served Native Americans as a meeting ground for centuries; the falls served as an obstacle to George Washingtons plan of making the Potomac navigable to the Ohio River, connecting the Atlantic waters to the Western frontier; it was home to an amusement park, carousels and all; and finally, in 1965, 800 acres on the Virginia side of the river became a National Park (1). The falls are considered to be one of the most spectacular natural landmarks in the D.C. area, consisting "...of cascading rapids and several 20 foot waterfalls, with a total 76 foot drop in elevation over a distance of less than a mile" (2). At only 15 miles from the capital, the park has become a favorite spot for locals and visitors alike; During the busy season the wait to enter the park regularly gets as long as 45 minutes! Based off my visit, I can see why. Beyond the main attraction, the park also features an abundance of diverse ecologies and geographical delights. 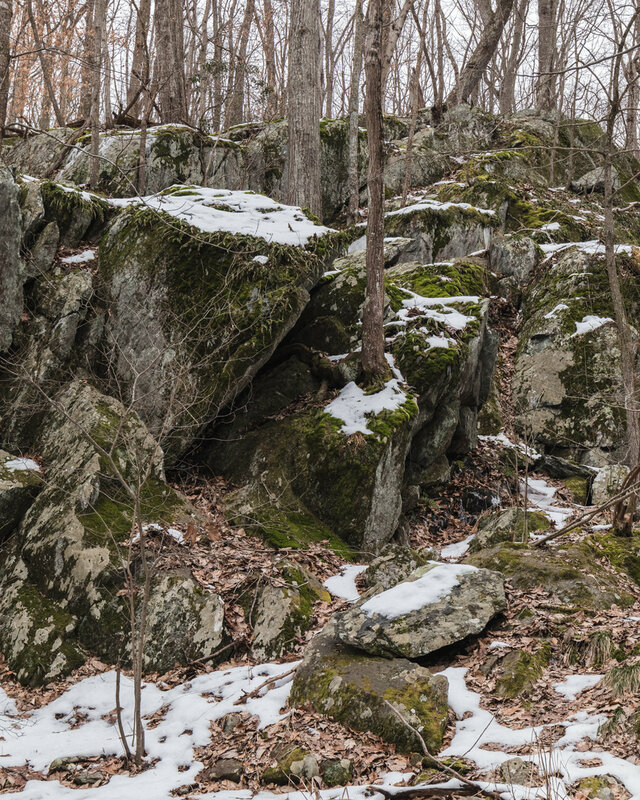 Visitors have the opportunity to explore the Potomac Gorge, cliffs, swamp land, and the surrounding forests, as well as visit ruins from the areas history. There is a great network of trails that criss cross the park. Each individual section is less than a mile, allowing you to build a "choose your own adventure" style trip. This was perfect, because I visited during the government shutdown. The park was still open, but the main gate was closed and I had to hike in from the edge of the park. I parked at the Difficult Run trailhead at the southern tip of the park, and with my camera in hand I began my journey. I quickly lost my melancholy, finding it replaced with a feeling of tranquility and a tinge of giddiness. From the parking lot I traveled up an unmarked trail, which I later learned was the Wolfpack trail, to the Ridge Trail, up a connector to the swamp trail, and finally I followed Old Carriage Rd. to the viewing areas. It was warm and pleasant for a January day, but the snow and ice from a previous freeze was still clinging for dear life. It created a stunning contrast between the white snow and the winter browns of the woods. I was so taken with the atmosphere of the area it seemed as though I was stopping every twenty feet to admire some new detail. As I made my way ever closer to my destination I began to hear the rushing water; not long after I could see the falls though the trees. There are three observation areas in Great Falls Park that each provide a unique view of the falls, as well as an overlook in the park across the river. As I mentioned before, this park can get very busy on peak days, but it was rather quiet while I visited. There were a handful of others that made the midweek pilgrimage as well, but the majority of my time there was spent in pleasant solitude. I never felt rushed or crowded, and I was able to take my time experiencing the falls in all its splendor. If you look at photos online, you will see rock formations that jut skyward as streams of water cascade through a maze of stone. This is not how it appeared when I visited. Due to recent flooding, the water nearly drowned the entire falls; the few formations that remained above the waterline buffeted by the ferocious rush of the river. The Potomac is considered dangerous during typical conditions. Across the park, visitors can find signs that extol the threat of the seemingly calm river: still, every year there are multiple deaths from people who are dragged in by the undercurrent. Yet even the most foolish would not have been tempted by the water the day I visited. Despite my distance from the river, the brute force of the turbulent current was readily apparent. Regardless, the safety of visitors appeared to be a top priority. Every 20-30 minutes an unmarked black helicopter flew overhead as it scoured the 15 mile Potomac Gorge for any poor soul that was unlucky enough to fall into the violent waters. I spent almost an hour surveying the falls from the three overlooks. The falls were phenomenal; they reminded me of the shut-ins I visited in Missouri, but at a scale I only dreamed of. The extent of the valley was too vast to do justice with a photograph, so I used my time photographing smaller details of the falls. Using long exposures I was able to create some very interesting compositions between the rushing water, which transformed into flowing, etherial clouds, and the stoic, unmovable dark rock. Once I was satisfied with my time at the falls, I set off to see more of the park. After my time spent at some of the more unrestricted natural areas in Missouri, I was concerned that the paths in this park would be very controlled. Thankfully, while researching the park prior to my visit I found areas along the gorge that have no barriers, providing expansive views of the river. I was looking forward to discovering those spots were the feelings of freedom, awe, and inspiration intersect. From the falls I followed the River Trail along the top of the gorge wall, I then crossed over to the Matildaville Trail, eventually switching onto Old Carriage Rd. which I followed back to the parking lot. On the first leg of the River Trail there are sections of the cliff face where rock climbing is allowed when the water is low, but unfortunately they were closed during my trip. As I walked along, hoping to find a place to scramble closer to the river, I came upon an open spur that headed down into the gorge. The path was closer to a climb, all boulders and ice. It was all I could do to make it to the bottom without slipping. The challenging route was worth it though, as I was rewarded with a wonderful view of a confluence between the main tributary and a channel that cut through one of the river islands. Being so close, I was again struck by the sheer force of the water. I have seen many rivers during my adventures, but none gave me such a profound sense that were I to slip, it would surely be my end, as the Potomac did that day. The remainder of my hike was moderately difficult, yet extremely fun. The views of the gorge where breathtaking: trees clung to the rocks that were once the bed of the Potomac, the cliffs tumbling downward, shaped over the millennia by the ebb and flow of the water, and the river itself extending out of view in both directions. When the path deviated from the cliff, there were many smaller scenes to enjoy as well. One particular standout was a petite waterfall that was flowing through ice and snow, into a valley the trail bridged over. Eventually I came to a dead end where the trail was closed due to maintenance on the canal that runs through the park. Turning back, I made my way around the closed area and continued on, reflecting on the journey I had just undertaken. I have often heard of creativity described as a muscle: it's something you have to exercise in order to keep strong. Just like exercise, when you haven't used your creativity in a while it can be difficult to start again. This is exactly when you need to buckle down, and just do it. I started this hike feeling uninspired, but upon completion I felt refreshed. Even now as I write this days later, I can't help but feel the same excitement I experienced while exploring the Great Falls Park. This trip was exactly what I needed to rekindle my creativity, and encourage me to continue exploring my new home. 2019 is going to be a great year!